Helping people through Motivational Speaking... - Jamie McDonald: AdventureMan, Author, Speaker. Superhero Foundation. After finishing my latest adventure, 200 marathons solo across Canada (doing so dressed as superhero, The Flash!) – raising more than £250,000 for the children’s charities that helped me as a very sick kid – I’d be lying if I said I was on top of the world. Once I’d finished, I felt numb to what I’d achieved. Like any goal, there’s not all that much fulfilment in reaching the end and therefore there was that reminder (or should I say, a huge smack in the face): ‘it’s all about the journey’. I slept rough. I ran, by myself, through -40C temperatures. I had a frost-bitten nose and numerous potential stopping injuries caused by me running a marathon pretty much every single day. The challenge was everything it was supposed to be and more. I was asked to speak at schools and for businesses along the way, and I loved doing so, but it was a means to an end at first – a way to fundraise and build support throughout the country. I quickly realised, though, that it was bigger than that. I found that I was inspiring people in many different and unseen ways. Speaking, to me, is more than standing up and talking at an audience. It’s sharing your story and inspiring people by having them connect to it in their own way. Not everybody will run across a country. Not everybody will have the chance – or make the stupid decision! – to do what I’ve done, but we’re all going through challenges, and we all draw inspiration from different places. It was exactly what I needed – and an incredible example of the invisible impact you can have, just from trying. I had no idea you could even be a ‘motivational’ speaker. Speaking, for me, is an opportunity whereby my adventure, and others I’ve done before, can hopefully hit the right note, with the right people at the right time. It is a chance for me to jump from serious elements of the story – like the above letter – to a video showing me get brought down a peg or ten by a Canadian ice truck, while screaming (do watch it:) ‘Who’s the Daddy!’ It allows me to, I hope, inspire people with messages to help them within their own lives. Having given hundreds of talks now around the world, I have realised one thing. I’m not there for ‘me’. It’s not only about the fundraising, as I first thought. I am there for the audience and my hope is they connect to what I have to say in their own way and apply it to their own lives. As I said, I wouldn’t expect people to start running across countries after my talk (in fact, I’d probably say you’d be daft to! ), but in everyday life and within our world of work we’re constantly having to overcome adversity. If I hope to show audiences anything, it’s that it really is all about the journey, but most of all, that ordinary people can do extraordinary things. After all – anyone can be a superhero! 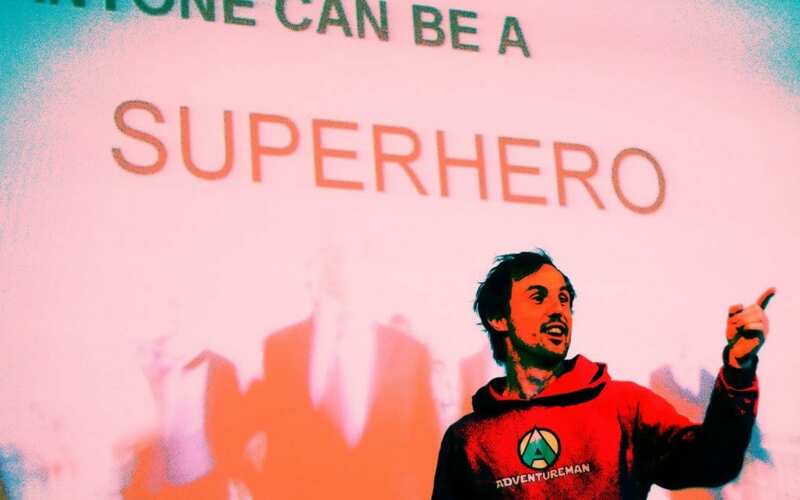 To read more about Jamie’s adventures, you can order his book, ‘Adventureman: Anyone Can Be a Superhero‘ – available now on Amazon.